Geologists are convinced the Precambrian rocks in Eritrea are an extension of the Arabian-Nubian Shield (ANS), the birthplace of mining. Workers want to work there, compared to bitter cold or sweltering jungle Eritrea's beaches are a better place to pitch a tent. Haven't been there yet, but seeing video and hearing scuba divers refer to Eritrea's deep-blue as the dive of their lives— I think I'm ready to book my accommodations for next year's Asmara Mining Conference. Nevsun Resources (NYSEMKT: NSU ) , in partnership with the Eritrean National Mining Company (ENAMCO), owns 60% of the Bisha Mine— Eritrea's first major international investment project. 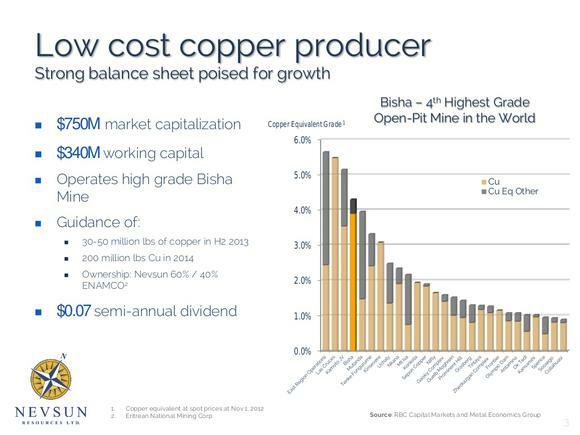 Milling at over 2% copper equivalent, Bisha is one of the highest grade open-pit copper mines in the world. In 2011, Nevsun began mining gold oxides from the surface layer of Bisha. This first "gold phase" of mining provided enough cash to pay a $0.07 semi-annual dividend (equates to a 4% yield) and fund their $110 million "copper phase" expansion. This investment increased mill capacity by 20% to 2.4 million tons annually; it also came in below their $125 million budget (a rarity for the mining industry). Nevsun shipped 22,000 tons of copper concentrate via the Red Sea in the month of October. Commercial copper production should be declared by years end. Looking ahead to 2014, Nevsun expects to produce 200 million pounds of copper. Eritrea's goal is to have four modern mines by 2017. Smartly, ENAMCO is using Bisha revenues to reinvest into other projects that are in the pipeline. DIY investors can use the top 10 holdings list of mutual funds like Vanguard and Blackrock to find great stocks. One would hope it spends as much money on due diligence as it does advertising on television, so don't be bashful about using its ideas for further research. Vanguard has endorsed Eritrea by making Nevsun the sixth largest holding in its $2.4 billionVanguard Precious Metals and Mining Fund (NASDAQMUTFUND: VGPMX ) . Last updated, it owned 38.5 million shares of NSU, or roughly 20%. Blackrock also likes this gold, copper, zinc producer— it owns 18%. Combined, the two financial powerhouses have a $266 million stake. Colluli, discovered by Australia's South Boulder Mines Ltd. is thought to contain 1.08 billion tonnes at 18% KCI, or 194 million tonnes of potash. If built for nearly $1 billion, it would be the largest and most conveniently located to sell potash into China and India. Temporary utility company Aggreko plc (LSE: AGK ) has found Eritrea to be a great place for doing business. It has been supplying the Bisha Mine with up to 22 megawatts; elsewhere in the country Aggreko supplies hundreds more. With over fifteen miners working in Eritrea, Atlas Copco AB (NASDAQOTH: ATLKY ) , a Swedish company that sells mining equipment to Nevsun, has been making a nice living there. Its representative cited the "big potash potential" yet to be developed. He went on to say that Atlas Copco sees very big potential in Eritrea. Next year, Aggreko and Atlas Copco will both be back to attend the fifth annual Asmara Mining Conference. Some describe it as the birthplace of gold. The Mahd adh Dhahab, also known as the cradle of gold, is thought to be the site of King Solomon's Gold Mine. Precambrian rocks of the ANS, separated by the Red Sea, are found in Saudi Arabia, Sudan, Ethiopia, Egypt and Eritrea. Geologically speaking, there is no doubt that more mineral discoveries will be made in Eritrea; geologists are excited about the future there. From the information I gathered, the Eritrean government just needs to keep doing more of the same. Workers on the ground have found them to take a slow incremental approach to development. Higher ups point to the lack of corruption. Nearly "corruption-less" sounds like a stretch, but that's how many are advertising Eritrea. All in all, the feelings and views shared by folks who live and work there are far different than the opinions of outsiders. One gentleman said he feels safer in Asmara than he does at some places in the UK. In Eritrea, the mining department had the opportunity to look at surrounding countries and find plenty of examples of what not to do. Perhaps they learned from those. The top 10 holdings list of mutual funds is a great place to find new stock ideas. It can be comforting to see that respected firms such as Vanguard and Blackrock are involved— but that alone doesn't warrant purchasing. As the first-mover in Eritrea, Nevsun Resources is their model company. ENAMCO needs them to be successful if they want to reach their goal of four modern mines by 2017. I think Nevsun's $0.07 dividend is safe. If it doesn't use its $290 million cash on an acquisition it could even increase from there.